INCH 101: Hengler's Circus/Apollon/Padoubny And The Challenge Dumbbell, Part 2. Inch 101 - A series of articles that will relay to you about the life of Thomas Inch and his famed Inch Dumbbell. Part 2 talks about the famous Challenge Bell and major inconsistencies from stories about Inch & the Challenge Bell. So much conflicting information has been written about Thomas Inch and his 172 lb challenge dumbbell that the amount of inconsistency is almost baffling. For the same incident, details vary in important nuances. Those readers aware of only one or two accounts may have found consistency among details, but those who have read accounts spanning decades will find it harder to untangle than Crystal Gayle&apos;s hair in a wind storm. Crystal Gayle is a country music and pop music singer. She is famous for her nearly floor length long hair and was voted one of the 50 most beautiful people in the world in 1983. Thomas Inch retold the story of his 172 in the American magazine Strength & Health in May 1939: After he left the bell at Hengler&apos;s Circus in London, "I did not go near the place for two weeks when I visited again with my friend Arthur Saxon, whose idea it was, and we asked who wanted the £200." It so happens that the wrestling championships going on at the time at Hengler&apos;s also offered a first place prize of £200. As an example of misinformation, look at Norman Miller&apos;s account of this same occasion when Thomas Inch left the 172 at Hengler&apos;s Circus, London, as recounted in Strength & Health magazine April 1936, starting on page 11. 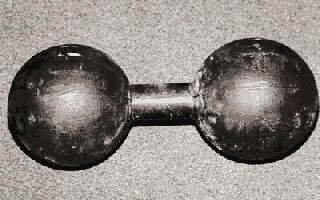 Miller wrote that Inch "had a very neat little dumbbell of 250 pounds or so, with a handle so thick "that no one but Inch could lift it". Actually Inch had another bell which weighed 153. But that is not the bell that was left at Hengler&apos;s. So even if the 250 was a typo for 153, the wrong bell was being described. Miller wrote that "With Hengler&apos;s Circus, the famous Continental show that was visiting London at the time, was Ivan Padoubny..." Hengler&apos;s Circus was not a traveling, visiting, circus, it was stationed in London. Years earlier other cities also had housed a Hengler&apos;s Circus branch. Ivan Padoubny was not &apos;with Hengler&apos;s&apos;- he was competing in the Titan&apos;s Tournament wrestling championship that was taking place at the Hengler&apos;s permanent location. Miller wrote that Inch left the dumbbell, implying a 250 pound dumbbell, with Padoubny for Ivan to try to lift. But Inch left the 172 pound bell. Miller wrote that Inch and Arthur Saxon returned to Hengler&apos;s later that same day to see how Ivan had handled the bell. Ivan had not moved the bell off the floor, so Miller writes that Inch picked it up with one hand and walked away. "Needless to say Ivan was a bit surprised and indeed so was Saxon." Really? Why was Saxon surprised? According to Inch, Arthur had seen Inch lift the bell many times. Further, according to Inch, Arthur himself had tried for years but could never lift the bell. Inch walked to a waiting vehicle, so however far this farmer&apos;s walk with the 172 was to that vehicle, it must have been an impressive feat. If it happened. One more factor: We know that Inch presented his 172 to a London audience for the first time on April 20, 1907, which fits the scenario. This was the day that Inch defeated Caswell in lifting. Perhaps Inch introduced the 172 elsewhere- though I can find no reference to that happening- but we know that April 20, 1907 was the first time the bell was shown to the public in London. One other important point about which almost no one with any lifting knowledge or experience will argue (hopefully): Any lifter can clean much more on a standard diameter bar than on a 2.38" diameter bar. One of the lifts contested was a Two Hands Clean and Bent Press. Inch managed 235 pounds, and failed with 271. Now, on the ONE HAND CLEAN and bent press, Inch managed 203.5 pounds. As anyone with any experience at thick handled lifting will tell you, if you can clean only 203.5 on a standard (1") bar, there is no way you can clean 172 pounds on a 2.38" bar (assuming you have average sized hands; and Inch claimed smaller than average). Probably no way you can clean 140 pounds on a 2.38" bar. So if Inch lifted the 172 on this occasion, it was a one hand deadlift, not a clean, and the contemporary accounts say nothing about a clean, or an overheading of the bell, just that he &apos;lifted&apos; it. Inch claimed to have invented the one hand deadlift at about the time World War I began, so perhaps that&apos;s why the thick handled bells were described only as being &apos;lifted&apos;. Notice please, not &apos;lifted overhead&apos;. 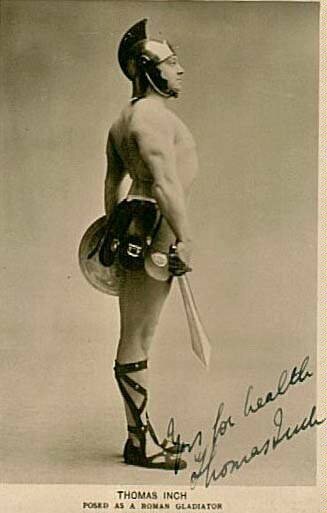 The bell was &apos;picked up&apos; and carried at Hengler&apos;s.
Thomas Inch wrote in Health & Strength magazine in the January 28, 1922 issue about Apollon: "When I met him he was past his best..." So when would that have been? In 1908 three dates become important: February 10, 12, and 18. At that time there was a wrestling championship taking place at Hengler&apos;s and both Padoubny and Apollon were there. On Monday the tenth, they wrestled each other to no decision. On Wednesday the twelfth Padoubny defeated Apollon, or so the judges called it, but Apollon and many in the audience raised very loud objections, and Apollon withdrew from the tournament. So it was decided that on the following Tuesday, February the 18th that, separate from the tournament, a re-match between Padoubny and Apollon would take place. Again 36 year-old Padoubny defeated 46 year-old Apollon at the Titans&apos; Tournament. Was Apollon &apos;past his best&apos;? So near as I can determine, the 172 was not manufactured until 1906 (contrary to popular understanding), so sometime between April 20, 1907 and December 26, 1910 was the Padoubny incident. I have been unable to ascertain whether Hengler&apos;s Circus was remodeled and then renamed the London Palladium, or whether Hengler&apos;s was razed then replaced by the Palladium. In either case, we must backdate from December 26, 1910 (The opening day as the London Palladium) to allow time for either remodeling or for new construction, so it may be that the window for the Padoubny incident was from after April 20, 1907 to, say, the end of 1909. So this was the occasion when Inch left the 172 for Padoubny to try. February 1908, when Padoubny tried to lift the bell. Why didn&apos;t Apollon try- his 9" long hands and massive strength would have toyed with the bell- as he had toyed with heavier, thick bells? Some of the information above was from the SPORTING NEWS, a British publication, and a friend sent to me the accounts of the times, which I am reading about 94 years after Thomas Inch probably read those same accounts. It is my belief that Inch read the report, or otherwise became informed of the fact that Apollon had dropped out of the tournament after Wednesday&apos;s loss, (and would therefore not be on hand at Hengler&apos;s). So I am guessing that Inch took the bell to Hengler&apos;s probably Feb 13th or 14th and either left it for the day, or a week as one account says, or for two weeks as another account says. The wrestling did not begin until 10pm, so Saxon&apos;s show was earlier in the evening as part of the program called The Grand Circus Programme. One suspects that Inch would have gone to see Saxon&apos;s performance at least once, but how would that fit into the scenario Inch claims about not going near Hengler&apos;s for two weeks? Another possibility is that Inch took the bell to Hengler&apos;s after the match on the 18th, if Apollon was to no longer be on hand for the remainder of the wrestling tournament. This would allow for the one week or two week period for the bell to be left. On March 13 Saxon was in Brussels, and I do not know how long he had been there. So, the bell had to be retrieved by Inch and Saxon before then. But we can confidently place this event between Feb 13 and March 13, 1908, for the reasons given above. And my conclusion is probably Feb 13 or 14, for one day only. Other world class wrestler&apos;s were at Hengler&apos;s for the tournament, and though Inch does not mention them by name, one wonders if any of them tried to lift the bell. Names such as Giovanni, Hansen, Woldt, Steadman, de la Calmette, Hints, Schoot, Cameron, and Mahmoud were there for that tournament according to SPORTING NEWS. Perhaps it is to these men he refers in his May 1939 Strength & Health article. The Inch 172 was not manufactured until, so near as I can determine, about 1906. Inch had previously mastered a regular 100 pound dumbbell with normal size handle and ordered another to weigh about 50 lbs more. Many have assumed this was the bell that ended up weighing 153, but in fact it was the 140 pound bell. We know that Inch&apos;s inaugural thick handled bell led to the famous unliftable (172) being manufactured later. And since it took Inch 5 years to master the 140 bell, that takes us to 1902 when according to Inch who then weighed only 140 lbs, he could put the 140 lb thick handled bell overhead with one hand. Really? In 1902 when he won Britain&apos;s Strongest Youth he could one hand clean and bent press 130 pounds- so are we to believe that he could clean the heavier thick handled 140 at that time? Again, if he lifted the 140, it was what we would now term to be a one hand deadlift. Also Inch said in MUSCLEMAN magazine in August 1953 that as he grew older and heavier he had other bells (plural) made which were thick handled. If the 153 and the 172 followed the 140, we have the plural explained. But if the 153 was the first bell then what other bell over 153 was there that we don&apos;t know about? W.A. Pullum, writing in Health & Strength magazine on July 10, 1952 recounts how the first bell was made, which keep in mind, Inch said was a &apos;mistake&apos; with the thick handle. Pullum writes: "He commissioned a local foundry to cast him a solid thick-handled dumbbell, giving his own specifications as to size and weight." Contrast the above paragraph with what Inch had written in Strength & Health in May 1939: "So you will see I had some fun with my bell, made entirely by accident when I was a boy". Inch then adds regarding the design and specs of the bell, "The foreman at the iron factory worked things out for himself." Inch then misleadingly refers to this first thick-handled bell, "That was how the Inch challenge dumbbell came into being and it was very many years before I could lift the bell myself. I often thought it was going to prove impossible." In fact this was the first of his challenge bells but not the one that ultimately became famous as THE challenge bell. As a matter of fact when Inch began holding competitions circa 1929/1930 using this same 140 bell it was referred to as the COMPETITION bell, and because several men were able to bring it to the shoulder with two hands and then put it overhead with one hand for REPS, Inch adamantly insisted that this was NOT his famous challenge bell. His trickery had returned to haunt him. A side point. When Inch referred to how long the 172 had been offered up for a challenge, the time span is too long. But certainly, if men failed with the 140 or the 153 then there was no chance for them to succeed with the 172, so his point, though misleading as to how long the 172 was offered, is valid in regard to the strength levels needed to lift it. Pullum goes on to explain how Inch eventually overheaded that bell: "... he could raise the bell in one straight pick up to &apos;end on&apos; rest at top of the thigh. From where, to take it to the shoulder was easy, to put it then overhead, easier still". So Inch used a Continental method, allowing the bell to rest on his thigh, after a deadlift to the knee probably, then kneeling down and shifting the bell higher on the thigh where leg thrust could help raise the bell upon standing. "Many readers wish to know how Inch gets his heavy dumbbells to the shoulder. 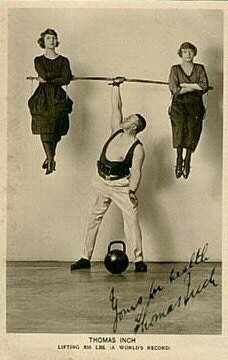 This photograph reveals the secret- a weight-lifting position never before illustrated." The photo shows Inch using two hands to the shoulder in a Continental as his torso is leaning back. Why, by the way - if Inch had demonstrated lifting his heavy dumbells all those years - would readers not already be aware of his technique? And why has there NEVER been a photo of Inch with the 172? Circa 1913 Inch had claimed that 2,000 men had failed to lift the challenge (172) bell, and he used to claim that he lifted that bell twice nightly during performances. Would not the word have spread among lifting fans who had witnessed this and told their gym buddies? The fact is, as another researcher said to me, it is surprising how SELDOM Inch and his 172 are mentioned during the very times the bell was supposedly so famous. I also have noticed this. It was not until decades later, when other men began to deadlift the 172, that Inch introduced the idea that he had always done the lift with one hand all the way to overhead. Inch knew that even if Padoubny could defeat the aging Apollon in wrestling he most certainly could not out lift him, so in my opinion, Inch carefully selected the window of time to offer Padoubny a chance at the 172. 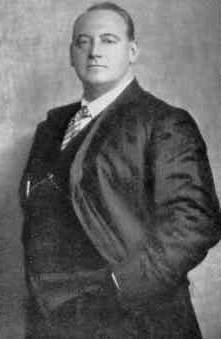 All of this depends on whether Padoubny appeared in a wrestling tournament at Hengler&apos;s Circus at some other time than in the 1907 to 1909 period, a situation I have not been able to determine. But also required is Saxon&apos;s presence at the time Padoubny was at Hengler&apos;s.
Right after this incident Saxon turned age 30 (April 28, 1908). But before that the bridge mishap with Saxon in Brussels had happened on March 13, 1908. Then in 1909 Saxon began his first tour of performances in the USA, and so far as I have been able to determine was not in England; coincidentally with Padoubny after that. So, it appears to me that the Titan&apos;s Tournament in February 1908 was the correct time to place this incident where all factors fit.